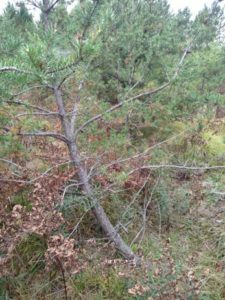 Damage from pine root collar weevils was recently reported in Lincoln, Marinette, and Vilas counties on jack pine trees. Pine root collar weevils are known to attack and kill all types of pines, although scotch, red, and jack pine are the most common hosts in Wisconsin. The insects attack pine trees of varying sizes – from large saplings to those of small pole size. Adult weevils deposit eggs at the tree’s base; larvae then bore under bark and feed in the root collar area, effectively girdling the tree. 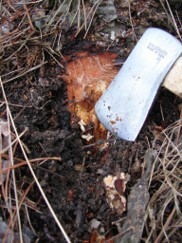 Soil and bark near the root collar becomes blackened and soaked with pitch. Feeding larvae are visible in tunnels under the bark. Adult beetles prefer dark, cool, moist conditions such as those found in tall grass or in the deep duff layer around the base of a tree. Substantial impacts on trees are seen after only a few attacks; trees may lean or tip and turn off-color. Severe damage can cause mortality. • Use an insecticide to kill adult weevils in the soil and root collar area (always follow label directions).